Healthy Meals and Snacks from Morning to Night from the Creator of Prevention RD, one of Healthline.com's "Best Weight Loss Blogs of the Year 2015"! Since 2009, registered dietitian Nicole Morrissey has been posting light and healthy recipes on her blog. Throughout the years, she has shared recipes that work for all types of home cooks, from chocolate addicts to breakfast-food fiends, and even budget shoppers. 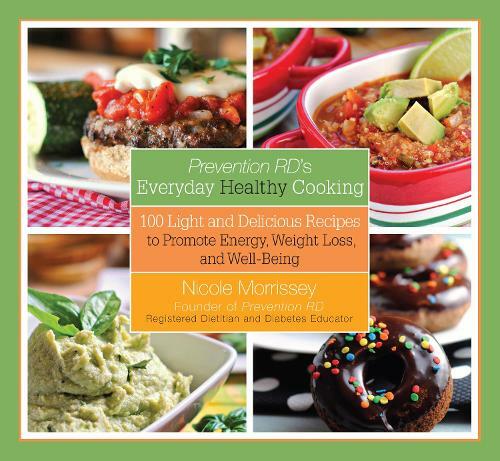 In Prevention RD's Everyday Healthy Cooking, Morrissey presents one hundred well-balanced recipes that promise to be both healthy and delicious. True to Morrissey's mission, each recipe includes complete nutritional facts and serving suggestions. Whether you're making buffalo wing hummus, Cajun chicken pasta, or mini honey cheesecakes with raspberry swirls, you'll always know the number of calories, carbohydrates, sugars, fats, and more thanks to the nutrition information Morrissey provides for every recipe. Learn about adjusting portion sizes and making recipes "light" through the Cook's Comments, Fun Facts, and Nutrition Notes spread throughout the more than two hundred pages of this collection.